Can I tour your farm? Our farm is our home first and business second. Since we are a diversified, working farm and have limited daylight hours to work, we are unable to accommodate drop by visitors and are only open to those who have purchased a seat at one of our classes, when we have them available. What the hell are microgreens? 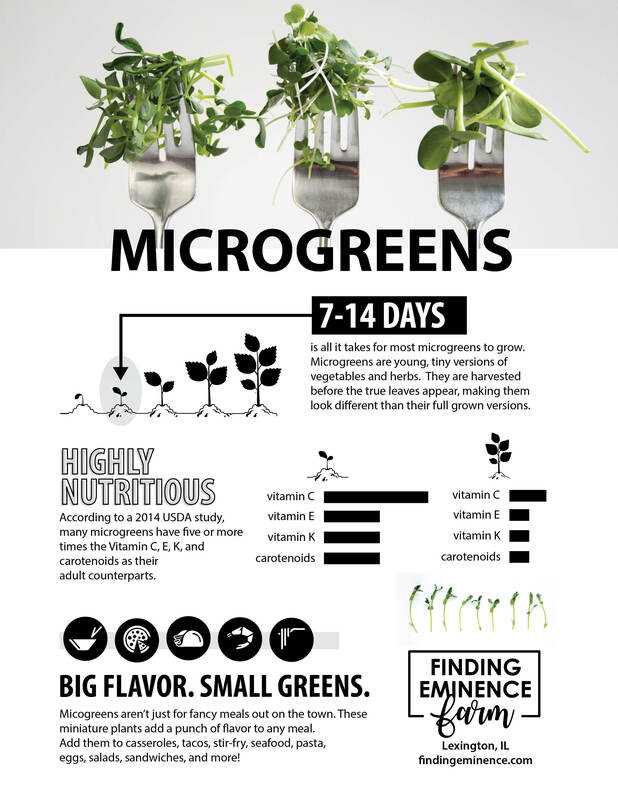 Microgreens, not to be confused with sprouts, are young, tiny versions of vegetables and herbs that are harvested as early as 7-10 days after planting. Though they are sometimes described as a garnish, these miniature plants are packed with flavor and nutrients when compared to their full grown counterparts. Where can I purchase your flowers and vegetables? Our micro greens and lettuce mix are often found at Green Top Grocery. Kemps Upper Tap is another great place our micro greens are found. Flowers are available by contacting us three days prior to when they are needed. Can I purchase a custom arrangement for a birthday or funeral from you? Yes, but since we are not a traditional florist and most of our flowers are utilized for weddings and wholesale customers and we need time to harvest and process the flowers. Therefore, we need a fair amount of time to plan and to create your arrangement. Please give us at least a three day notice if you need a custom arrangement. How can I get updates about your farm? Can I use your photos and/or content? Don’t be that guy that uses our stuff without our permission. Seriously, no one likes that guy. Please ask if you can use our photos and content prior to posing anything. We greatly appreciate links to our website.